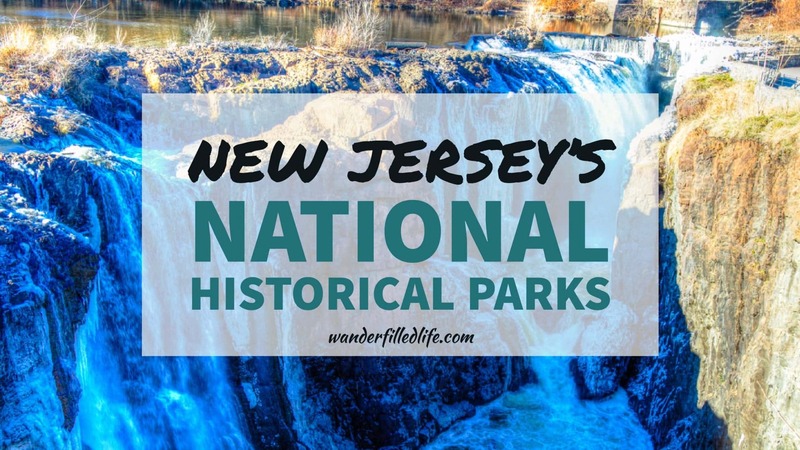 Our quest to visit all 50 states (and all the units of the National Park Service) finally took us to the New Jersey National Historical Parks. Like many people, we do not love New Jersey, so this is one that we have been dreading. But, it is important to us to visit these sites, so we did! I will admit, New Jersey does have some redeeming qualities. But, overall, we were happy to spend just one full day there and then leave! Thomas Edison’s study is where he worked on a lot of his designs… and took a lot of naps. Apparently, his wife got tired of him sleeping just anywhere, so she made him put in a bed in the study. Too much traffic and too many people are just a couple of the reasons we were happy to keep our visit to New Jersey brief. On the plus side, there were more trees than we expected. Even in the winter, we could see that there is definitely some natural beauty here. 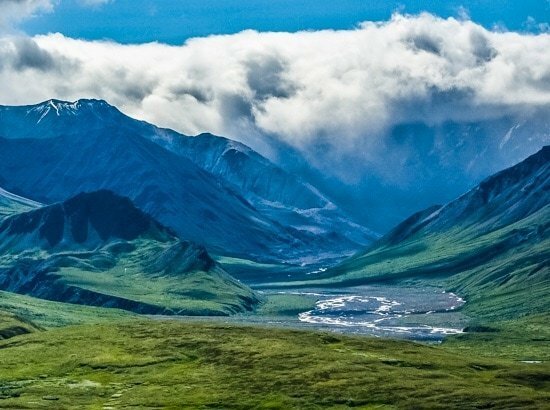 For us, the only real motivation to visit New Jersey is to see its National Park Sites. 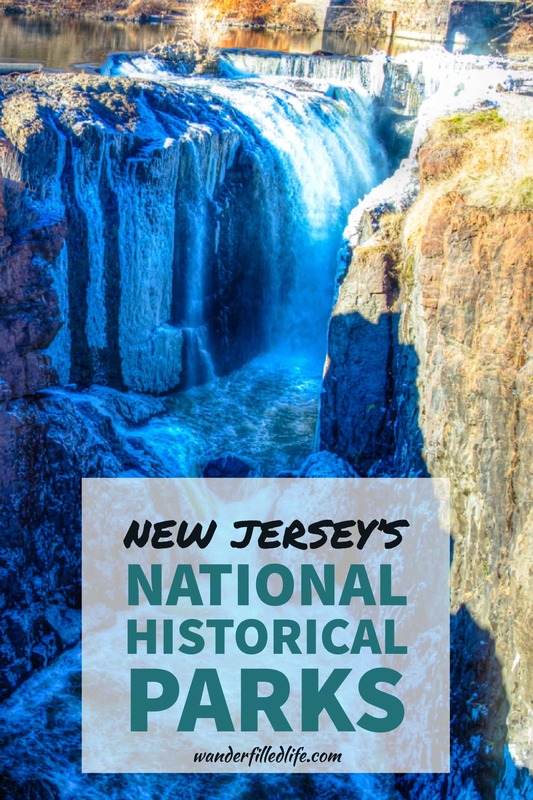 New Jersey is home to three National Historical Parks: Morristown, Paterson Great Falls and Thomas Edison. All three of these parks are located less than an hour west of New York City. 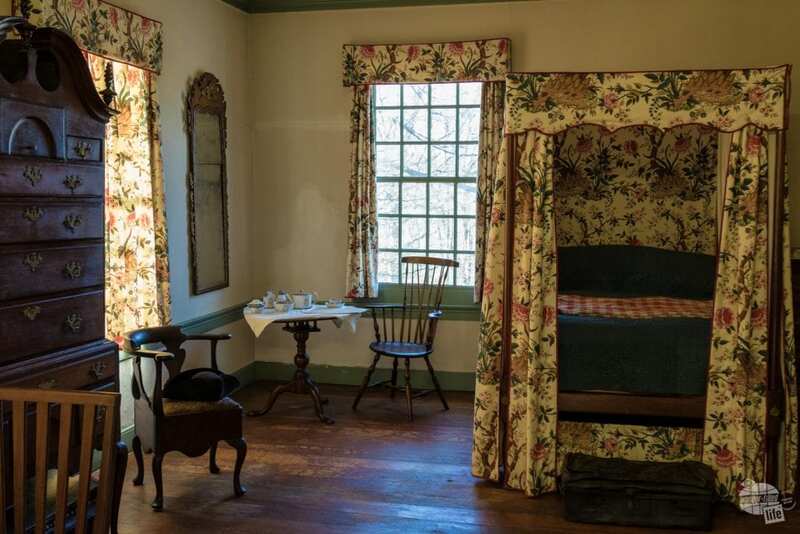 George and Martha Washington’s bedroom in the Ford Mansion in Morristown. 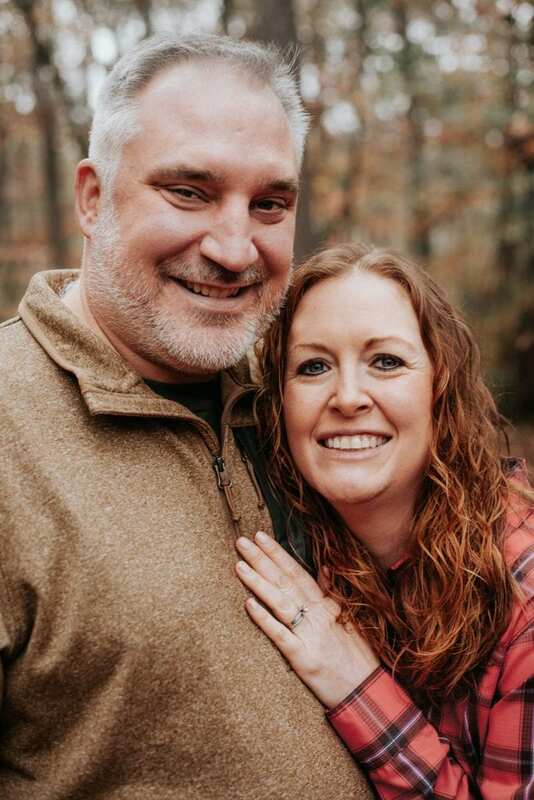 There are also two rivers in New Jersey that are preserved by the National Park Service, but we did not visit those on this trip: Delaware Water Gap National Recreation Area is on the Pennsylvania border and Great Egg Harbor Scenic and Recreational River is near the southeast coast. While we would much prefer just one visit to New Jersey, it was just too cold to really enjoy the rivers in the winter! 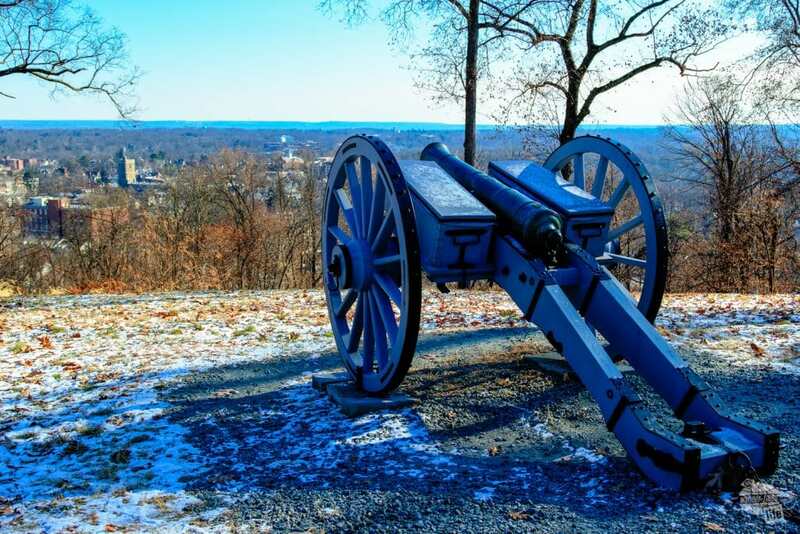 The first site we visited was Morristown, which preserves the winter encampment of the Continental Army, under General George Washington, during the Revolutionary War. The site includes the house that served as Washington’s Headquarters (Ford’s Mansion), the Jockey Hollow Encampment Area (where the soldiers camped) and Fort Nonsense (a fortification). What makes this encampment especially noteworthy is that the winter of 1779-80 was one of the coldest winters on record. More than 20 snowstorms cut off supply lines to necessities such as food and clothing. Men struggled to not just build the camp in the snow and bitter cold, but to stay alive. 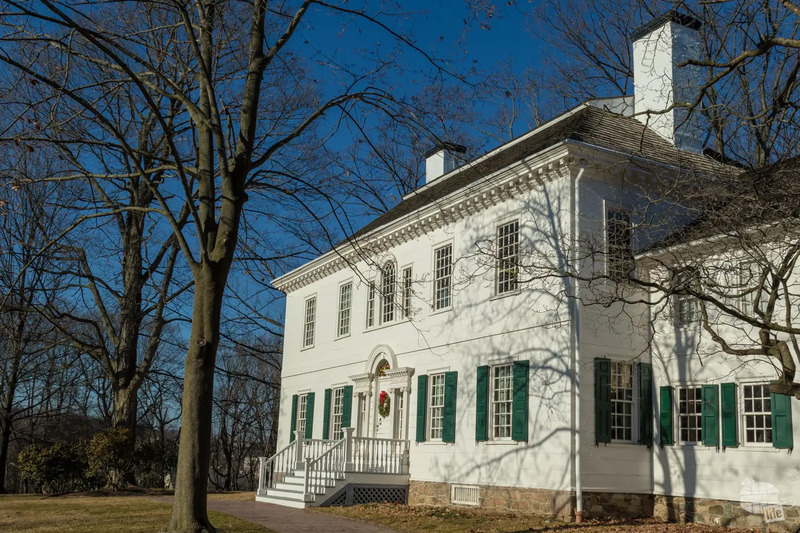 The Ford Mansion served as Washington’s headquarters when his army wintered nearby. Your visit to Morristown should start at the Visitor Center and Museum. Be sure to watch the video which gives a good overview of the conditions and what the army endured. I cannot even begin to imagine what these men (and women) suffered through. There are also two main exhibit rooms. One covers military life and weapons; the other holds antiques representing the life of wealthy families in the 18th century. We found the exhibits interesting, but the movie is the best part of the museum. The Visitor Center is located directly behind the home of Theodosia Ford, a widow, who allowed her house to be used as Washington’s Headquarters. Mrs. Ford moved herself and her four children into just two rooms while Washington and his men took over the rest of the house. The house was reasonably nice for the 1700s, but can you imagine having it literally taken over by the army? 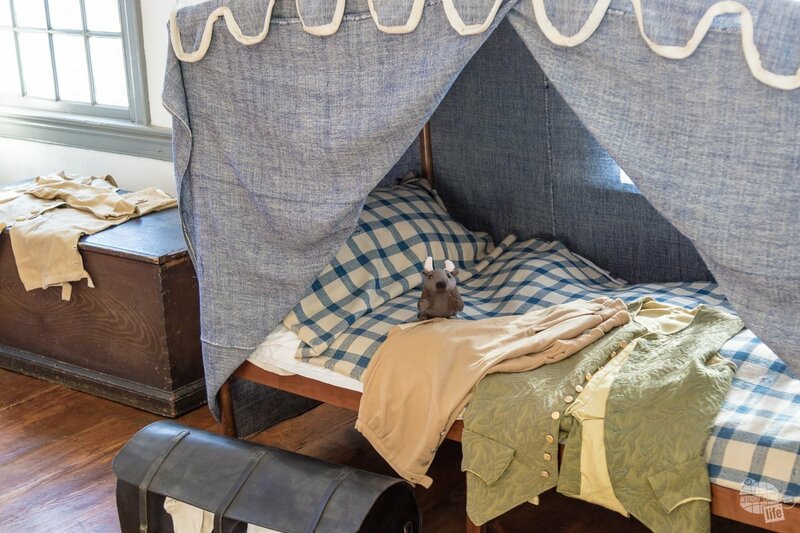 Buddy Bison on the bed of one of Washington’s aides at his headquarters at the Ford Mansion at Morristown. Buddy Bison is the “mascot” of the Park Service. The National Park Service has restored the house to its size and appearance when Washington was there. You can only visit the house on a guided tour, which lasts about an hour. I imagine there is a much greater demand for tours in the summer, so you may need to plan ahead. A short drive from the Visitor Center and you will find Fort Nonsense. Washington’s troops built earthworks and trenches atop this crest in May 1777. From here, there is a great view of the surrounding area. Today, you will find a short exhibit trail, picnic tables and an overlook. Fort Nonsense overlooks Morristown and provided a defensive lookout for the troops wintering nearby. The Jockey Hollow area of the park shows the area where the army actually camped, several miles away from Washington’s Headquarters. There is a short driving tour with several stops that point out historically significant sites of the camp. There is a visitor center here, but we did not visit it. What we enjoyed most about this part of the park were the recreated cabins that the soldiers built and lived in. 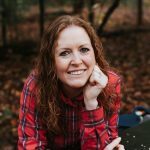 There were very specific guidelines regarding how the cabins were to be built; any cabin not built to standard would be torn down and rebuilt! 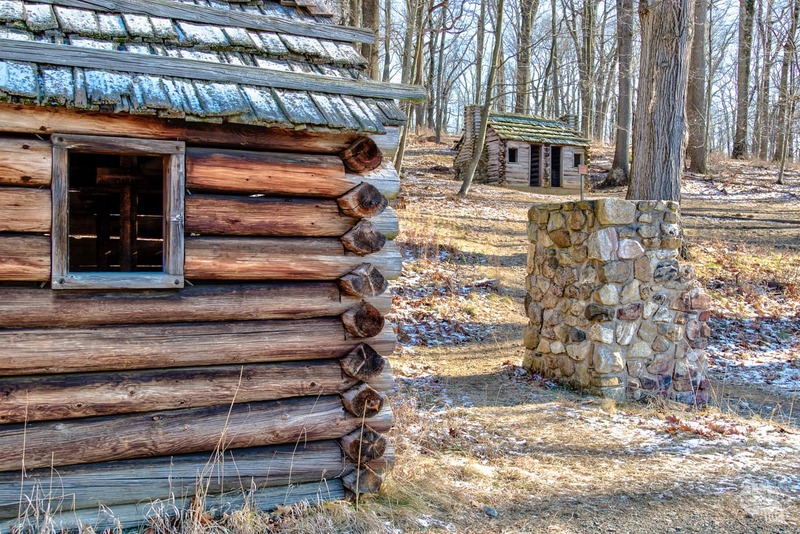 Jockey Hollow provided some shelter from the horrific winter, but the troops had to build their cabins in the snow. You can see not only soldier’s cabins, which housed 12 men each, but also the officer’s cabins, which housed only one or two men, depending on rank. All cabins were rustic but adequate. There are several trails in this area as well, but considering the temperatures were in the 20s, we skipped them! That is one downside to visiting sites in the winter. Our second stop in New Jersey was in the town of Great Falls, about 30 minutes northeast of Morristown. Today, the town is a bustling and congested suburb of New York City. Historically, it was the first planned industrial city. The park Visitor Center is little more than a small bookstore with a couple of maps. We quickly got a brochure and a magnet, used the restroom, and were on our way. Great Falls in Paterson was the spark which created an industrial community which created everything from silk to Colt revolvers. 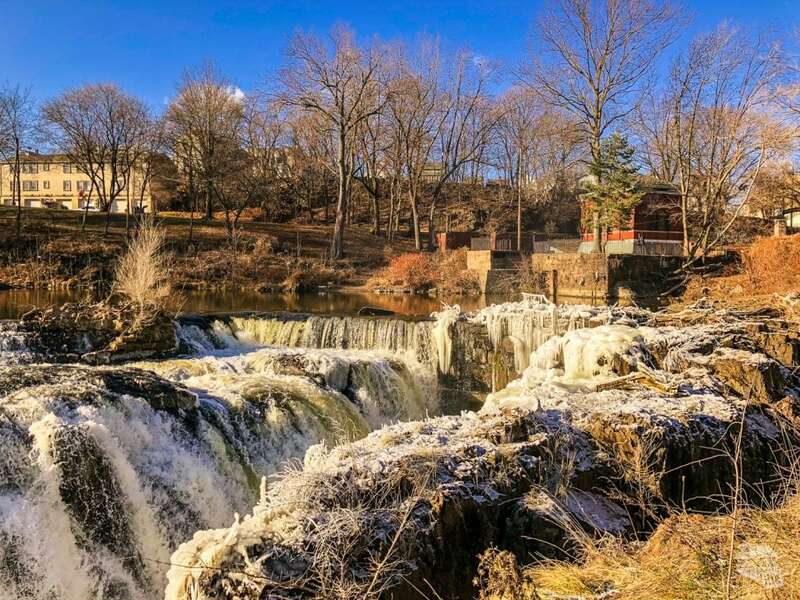 The highlight of the park is the Great Falls of the Passaic River, right in town and just a short walk from the Visitor Center. Overlook Park provides a nice view of the falls. The park also provides a self-guided walking tour that explains the sites around town and the history. The Paterson Museum, a couple blocks from the Visitor Center is not an official part of the Historical Park but is a partner site of the National Park Service. According to the Paterson Great Falls NPS web site, exhibits “include textile machines, Colt revolvers, steam locomotives, and the prototype of the first modern submarine, which was tested in the Passaic River.” We skipped this museum, as it seemed too similar to the museum at Lowell National Historical Park in Lowell, MA, which we visited in 2016. We found the town of Great Falls to be way too busy for our liking. Of course, there was also a building fire just down the road from the Visitor Center, which affected traffic, and definitely tested our patience! The falls themselves were pretty, but the trash that piled up in them was not. Overall, this city is the perfect example of stereotypical New Jersey and we hope we never have to return. The third, and final, National Historical Park in New Jersey in Thomas Edison NHP, less than 30 minutes south of Paterson. 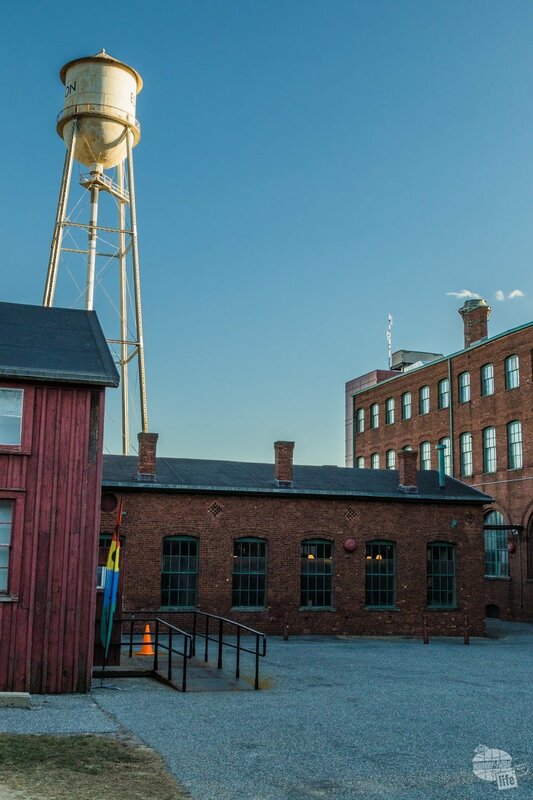 This site preserves Thomas Edison’s home and laboratory complex. Of course, the home was closed when we were there, but the lab was worth the visit on its own. The lab complex at the Thomas Edison National Historical Park. The Visitor Center is located at the laboratory complex. Along with a bookstore, the Visitor Center has a few short movies, which we did not watch (the ranger indicated they were not a must-see). The complex includes more than 10 buildings, only some of which are open to the public. The main laboratory is three floors of awesomeness and the highlight of this park! 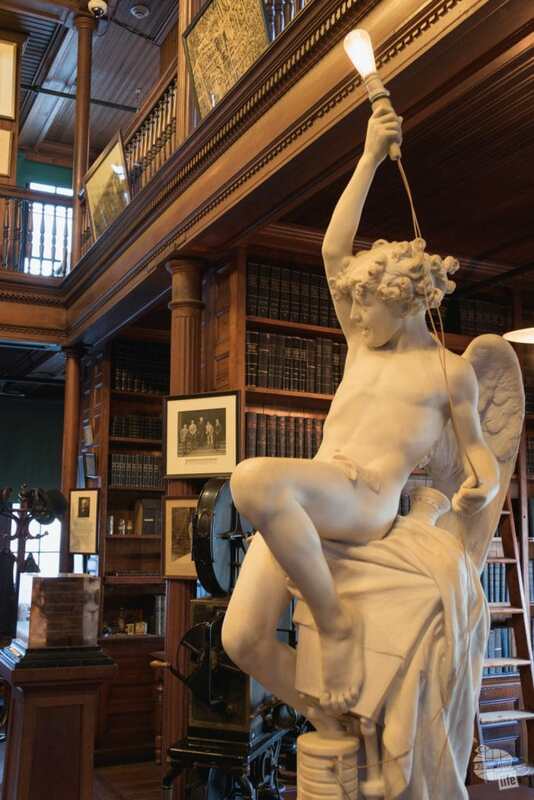 Some of our favorite rooms were Edison’s Library (including a bed for his daily naps), the Music Room and the Stock Room (so many things and sooo organized!). 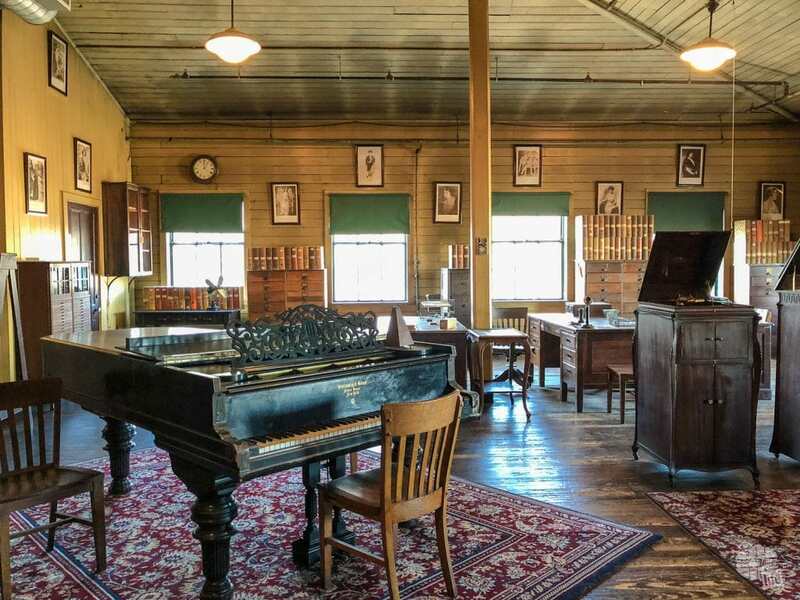 Edison was known for inventing the phonograph and the music room collects several photographs as well as a library of records. 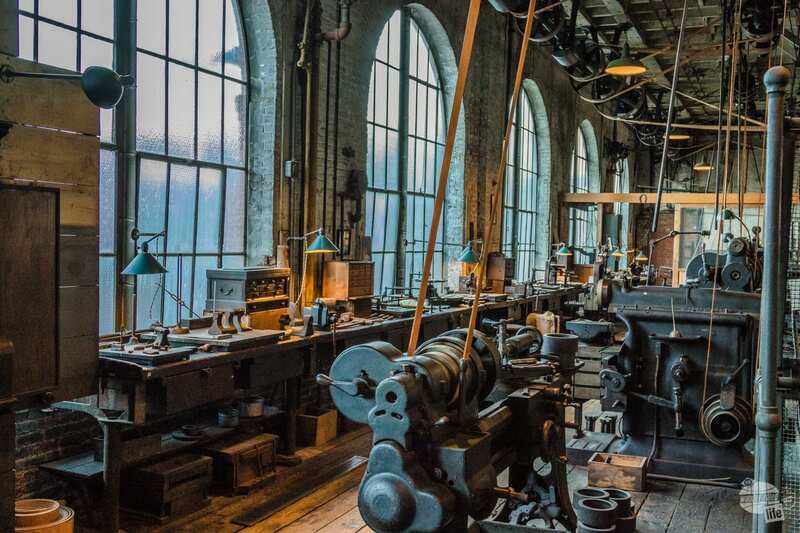 Other rooms include both a Heavy Machine Shop and a Precision Machine Shop, a testament to Edison’s claim that his shop could make anything from a ladies’ watch to a locomotive. Rangers were scattered throughout the main laboratory to answer questions and give brief explanations, which was wonderful – the size and scope of this lab is truly astonishing! Edison’s workshop and lab complex had a full machine shop. It was said the shop could produce everything from a locomotive to a lady’s watch. The Black Maria, the world’s first motion picture studio, is another interesting and unique piece found at the complex. Built on a “turntable” and with a retractable roof, it allowed for optimal sunlight. We spent a little over an hour here. Anyone with a specific interest could easily spend more time. Of course, adding on a tour of Edison’s house, Glenmont, would add probably at least another hour. All of these parks are located within about 30-45 minutes of each other. We stayed in Parsippany because it was somewhat centrally located with a good point value Embassy Suites. Our only other excursions, besides the National Historical Parks, was to Walmart and a gas station. The area around Parsippany was typical suburbs, without too much traffic or craziness. Our biggest “complaint” is that you cannot pump your own gas in New Jersey. It really did feel weird to sit in the car while someone else did the work for us. I suppose we were somewhat grateful for this since the temperatures were only in the upper 20s/low 30s, but it was still weird. We are glad that we visited New Jersey so that we can check it off on our list of states visited. Two of the three NPS sites that we visited were interesting and informative. Honestly, Paterson Great Falls just seemed redundant to Lowell NHP. I suppose if we had not previously been to Lowell, we might have found it more interesting. Unfortunately, we will have to return at some point when it is time to see the other two NPS sites. We will probably make that visit when it is a bit warmer and we can actually enjoy some outdoor activities!